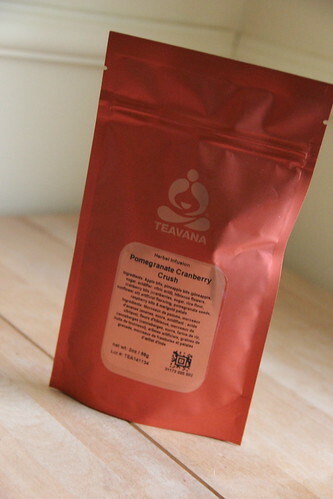 Another tea I purchased recently from Teavana was Pomegranate Cranberry Crush. 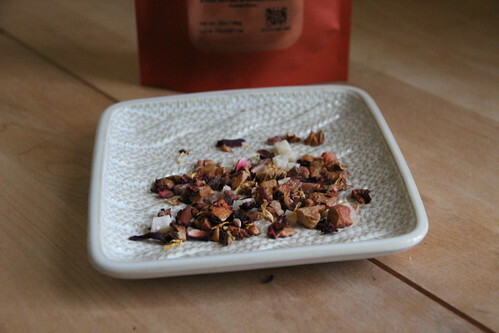 This herbal infusion contains apple bits, pineapple bits, hibiscus flowers, cranberry bits, pomegranate seeds, raspberry bits and marigold petals. It is available in a variety of sizes: 2oz for $6.98, 4oz for $13.96, 8oz for $27.92, 16oz for $55.84, 3lb for $167.52 and 5lb for $279.20. When I opened the package I mostly smelled cherry, but there was another smell that I hate to say was a little off-putting. It reminded me a bit of the Currant Affair from David’s Tea that I didn’t much care for. However when I pulled a smaller amount aside and put it in a tea bag to brew, I found the tea smelled fresher and sweeter. While brewing I got more of a hibiscus smell. I was pleasantly surprised that when I drank the tea, it was just sweet hibiscus and cherry. I didn’t really get much of the pomegranate, but this was a delicious fruit tea. Maybe a candidate for next year’s summer iced teas?